1966. It was a Landmark Night. The 72-65 victory over Kentucky in College Park, Maryland is considered one of the most important in the history of college basketball, as it marked the first time that a team with five African-American starters won a title game. The Miners played against the Kentucky Wildcats, a team that had no African-American players during the period of the Civil Rights Movement. The civil rights movement to end discrimination against blacks was in full swing. Although the 1954 Brown v. Board of Education decision and the Civil Rights Act of 1964 outlawed institutional racial segregation, it was still common to find all-white college sports teams, particularly in the South. 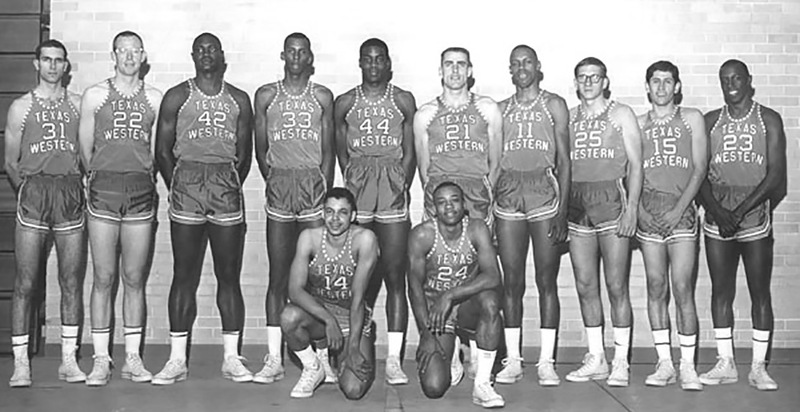 However, in the remote desert city of El Paso, Texas where a melting pot of cultures on the U.S-Mexico border had existed for years, race wasn't an issue for the Texas Western College basketball team. Winning was. Led by Don Haskins, a gruff, straight-talking coach known as "The Bear," the Texas Western Miners lit up the 1965-66 regular season with a 23-1 record. A tight-knit group of blacks, whites and one Hispanic, the Miners played their way to the NCAA championship game against Adolph Rupp's No. 1-ranked Kentucky Wildcats, an all-white team. History was made on the night of March 19, 1966, at the University of Maryland's Cole Field House in College Park, Maryland when Haskins started, for the first time, an all-black lineup in the NCAA championship. In a game punctuated by David "Daddy D" Lattin's thunderous dunks and Bobby Joe Hill's lightning-quick steals, the Miners upset Kentucky 72-65 for the national title. The win soon grew into a symbol for blacks' breakthrough into college sports. After the 1966 championship, college teams throughout the South began aggressively recruiting black athletes, ending years of shameful segregation. In 1967, Texas Western College changed its name to The University of Texas at El Paso, popularly known as UTEP. Haskins, a humble and private man who did his best to avoid the public spotlight, always said that color of skin was never an issue when he put his Miners on the court against Kentucky. "I was simply playing the best players I had. It was what I had done all year," Haskins said. Haskins endured hate mail and death threats during a bitter period after the '66 championship. He went on to produce many more winning teams and NBA stars before retiring from UTEP in 1999. Haskins passed away Sept. 7, 2008, in El Paso. Name Game FG Pct. FT Pct. Reb Reb. Avg. PF TP Avg.